The Sunday bird walk went to Neck Point Park in Nanaimo. The morning was sunny and warm with a cool wind blowing off the Strait of Georgia. We spotted American Robins mobbing a Great Horned Owl. A Marbled Murrelet, several Pelagic Cormorants, Surf Scoters and Double-crested Cormorants flew by along the Strait. Canada Goose, Turkey Vulture, Surf Scoters Double-crested Cormorant, Pelagic Cormorant, Great Blue Heron, Bald Eagle, Great Horned Owl, Marbled Murrelet, California Gull, Glaucous-winged Gull, Belted Kingfisher, Spotted Sandpiper, Northern Flicker, Warbling Vireo, Northwestern Crow, Common Raven, Chestnut-backed Chickadee, Bushtit, Brown Creeper, Bewick’s Wren, Pacific Wren, Anna’s Hummingbird, Pacific-slope Flycatcher, Swainson’s Thrush, American Robin, European Starling, Spotted Towhee, Song Sparrow and Pine Siskin. Great Horned Owl: Hans Laue Photo. 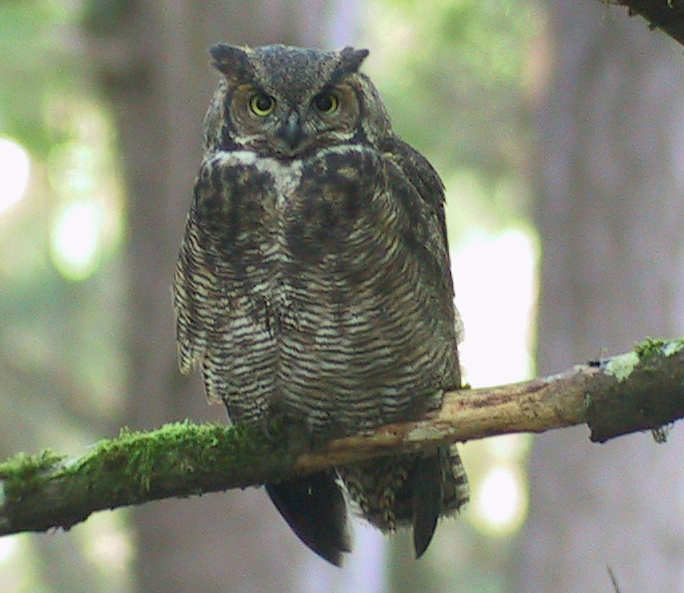 On July 10, a Great Horned Owl was seen along the road to the over flow parking areas at Rathtrevor Park in Parksville. On July 09, a Barred Owl was spotted twenty feet from the yellow gate on the river side path at the Englishman River Estuary on the Shelly Road side in Parksville. 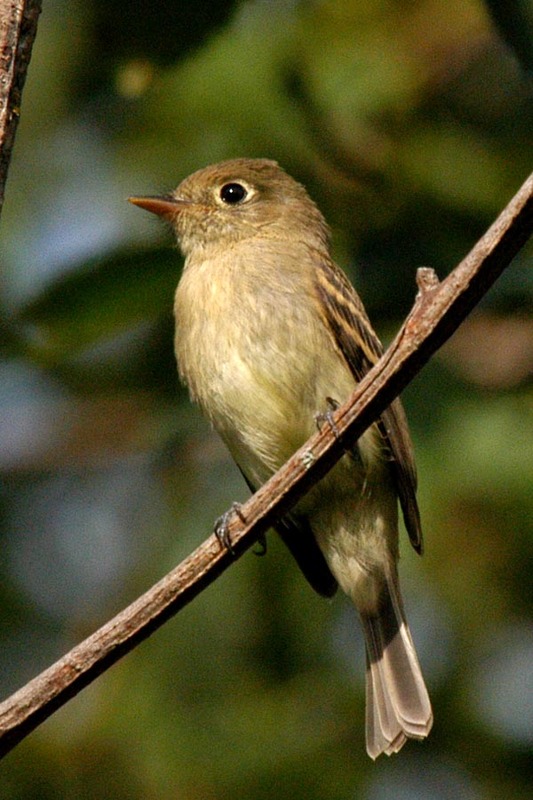 A Family of Hammond’s Flycatchers was spotted at Springwood Park in Parksville. A male Downy Woodpecker and a Hairy Woodpecker were seen visiting a feeder together in Ladysmith. Great birds and lovely companions - what more could one ask for! The Sunday Bird Walk on July 21 will be going to Moorecroft Regional Park in Nanoose Bay. 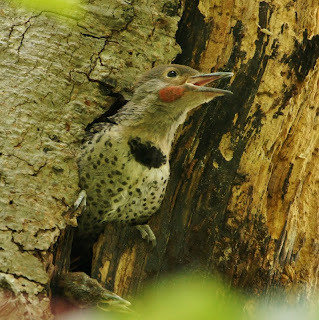 We will meet at the bird store at 9:00 a.m. or at 9:20 am in the parking lot at Moorecroft Regional Park off Stewart Road (off Northwest Bay Road in Nanoose Bay) Look for Park sign on Stewart Road. 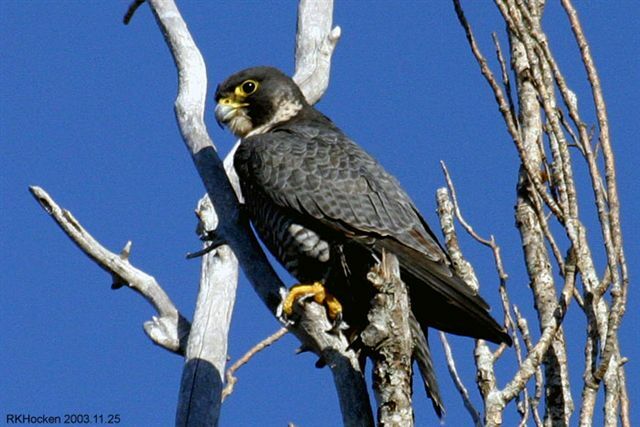 The Sunday bird walk went to Legacy Marsh in upper Lantzville. The morning was sunny and warm with a cool breeze blowing making for a great morning of birding. An American Robin was spotted mobbing a Barred Owl. 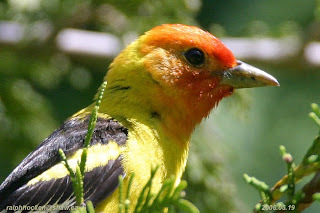 We had great views of a Western Tanager when he came down low several times to pick Thimble Berries from a low bush close to the trail. 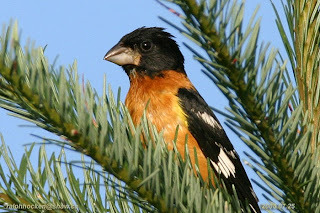 Two male Black-headed Grosbeaks put on a show as they chased each other next to the trail. We watched as a pair of California Quail walked along the edge of the road with one tiny chick—a lovely sight to see. A Willow Flycatcher gave us a great performance as he sang from a low perch. Mallard, Turkey Vulture, Barred Owl, Band-tailed Pigeon, Anna’s Hummingbird, Rufous Hummingbird, Belted Kingfisher, Downy Woodpecker, Northern Flicker, Northwestern Crow, Common Raven, California Quail, Violet-green Swallow, Barn Swallow, Chestnut-backed Chickadee, Bewick’s Wren, Marsh Wren, Pacific Wren, Bushtit, Brown Creeper, Black-headed Grosbeak, Swainson's Thrush, American Robin, Cedar Waxwing, Orange-crowned Warbler, Black-throated Grey Warbler, Common Yellowthroat, Warbling Vireo, Pacific-sloped Flycatcher, Willow Flycatcher, Western Tanager, Brown-headed Cowbird, Spotted Towhee, Song Sparrow, White-crowned Sparrow, Red-winged Blackbird, Purple Finch, Dark-eyed Junco, American Goldfinch and Red Crossbill. A White-winged Crossbill was seen at the Morell Modular Home Park in Nanaimo.